These papers were transferred to the University of Pennsylvania Archives and Records Center from the Mask & Wig Clubhouse (310 South Quince Street; Philadelphia, Pennsylvania) by club historian John Dixon Bartle, in December 1975. The documents for the Mask & Wig Club productions are arranged in seven series and include: Scripts (1890-1965), Scores (1889-1964), Lyrics (1891-1949), Miscellaneous (1897-1967), Photos (1889-1937), Photo Albums (1902-1910) and Programs (1889-1989). All series are arranged chronologically. The Mask & Wig Club was founded in 1889 by Clayton Fotteral McMichael as an all – male peformance group. In that year, a notice posted in College Hall urged students to try out for the new club, concluding with the Henry VI line “Defer no time; delays have dangerous ends.” Prompted by this unofficial motto, the Mask & Wig Club staged their first production, Lurline, at the Chestnut Street Opera House. Since then, the “Wiggers” have annually entertained the University of Pennsylvania community with their burlesques and original revues. Productions are musical comedies which often satirize current events and University life. Mask & Wig members and alumni write, produce and direct each show, and design the elaborate stage props and costumes. Wiggers play both male and female roles, accounting for much of the humor of the skits. The highlight of the year is either a Thanksgiving or Easter production, when the Club performs in Philadelphia and tours several cities to act for alummni and friends. Rehearsals and social activities often take place at the Mask & Wig Clubhouse at Quince Street. Purchased as a stable in 1894, the Clubhouse was remodeled and includes an auditorium with stage and dressing rooms, a grill room, office and kitchen. The Club has donated much money to the University, both for general funds and such student organizations as the football and crew teams, Glee Club and Debating Team. The largest contributions helped endow a chair in the Dramatic Arts, aided the purchase of the Provost’s House, and established the Mask & Wig’s McMichael dormitory, which is located in the lower section of the Quadrangle. 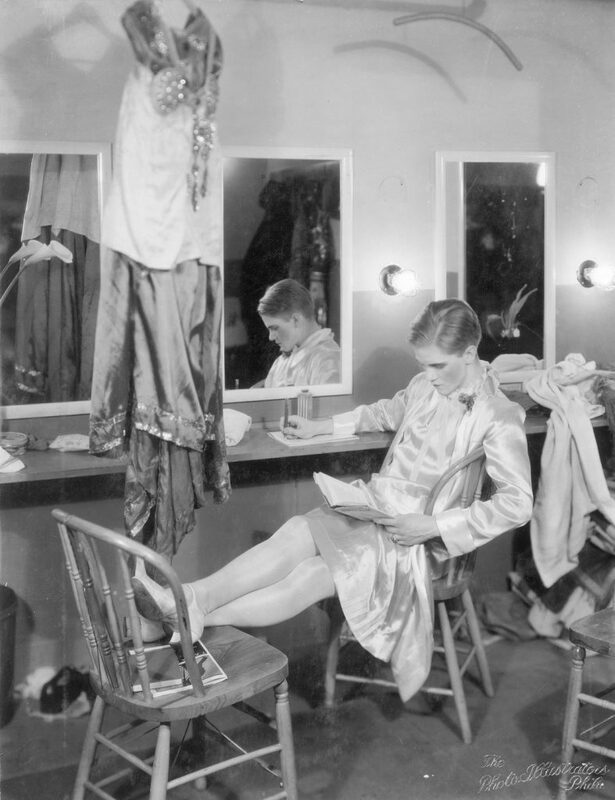 The Mask & Wig Club documents chronicle the history of the all-male University of Pennsylvania singing and dramatics organization. Included are production materials from 1889 to 1989. Scripts represent published booklets of each show’s dialogue. Scores consist of published and handwritten orchestrations for the pit orchestra, primarily violin and piano music. Lyrics include bound booklets of each show’s tunes; many were written by University and Mask & Wig alumnus Charles Gilpin. The section of miscellaneous documents includes programs and lyrics for special alumni and freshman performances, rules governing the McMichael dormitory and a book chronicling the organization’s history from 1889 to 1941. The photos for each show portray Mask & Wig performers in costume; they include individual and group pictures taken at a professional studio and on stage. The photo albums consist of the same material. Oversize photographs are stored separately. Finally, the program collection includes bound and illustrated brochures describing each production. Programs include a short synopsis of the play, photographs of the production, a cast of characters and biographical descriptions of the Club’s current board members. In addition, each program includes a listing of all Club alumni and previous productions to date.